Catching The 750 GeV Boson With Roman Pots ?! I am told by a TOTEM manager that this is public news and so it can be blogged about - so here I would like to explain a rather cunning plan that the TOTEM and the CMS collaborations have put together to enhance the possibilities of a discovery, and a better characterization, of the particle that everybody hopes is real, the 750 GeV resonance seen in photon pairs data by ATLAS and CMS in their 2015 data. What is TOTEM, first of all ? Well, TOTEM is a collaboration that operates some high-rapidity detectors located around the CMS collision point at the LHC. And before you ask, rapidity is a measurement of how close to the beam a particle is emitted by a collision. Particles emitted orthogonally have rapidity equal to zero; particles traveling at angles increasingly close to the z axis (which we take to be the beam axis at the collision point) have higher positive or negative rapidity (the sign depends on the verse, and is determined by convention). Below is a schematic of the detector. Totem measures the protons as they are emitted at very small angle from the collision in a series of very peculiar phenomena. Usually protons break up when they collide, but sometimes they do not. In order to not break apart, the protons must not be exchanging a net amount of colour charge - otherwise they would become coloured themselves, and quantum chromodynamics then prevents their existence as asymptotic states - pardon, stable bodies. All these "glancing" collisions can be studied with TOTEM. There are "diffractive" collisions, "exclusive production" processes, elastic collisions. It is all physics that TOTEM can study effectively as it instruments an angular region that other experiments have no access to. The instruments are telescopes and roman pots. The telescopes are built with cathode strip chambers and Gas Electron Multipliers; the so-called "roman pots" use silicon strip detectors that can be moved to and away from the beam, reaching down to very, very small angles. TOTEM occupies a region 500 meters long around the CMS "P5" interaction point. Already in 2015 TOTEM and CMS collaborated to analyze together some data and obtain more information from the two combined detectors. For 2016, however, the plan is even more focused toward a collaborative effort to study the possible 750 GeV resonance. In fact, it is very plausible to believe that such a particle could be created, some 5-10% of the time, in an "exclusive" fashion by the proton-proton collisions. The two protons would create the new particle, losing some of their energy, and emerge at small angle from the beam without breaking apart. TOTEM could measure the protons and determine the "missing mass" that they have produced. The issue is not straightforward, as the beam parameters have been changed from the 2015 run, and the "safe" configuration of the TOTEM roman pots (they are very close to the beam, but must not interfere with it in any way!) might not allow them to measure the protons in the kinematic range of interest to the exclusive production search. But it seems that this problem could have been solved recently. Already by itself, TOTEM could reach a resolution of the order of 30 GeV on the missing mass, enabling a search for exclusive production of the new boson which could be possible irrespective of the decay mode of the particle (even neutrino decays would be "seen", as what is measured are the recoiling protons! 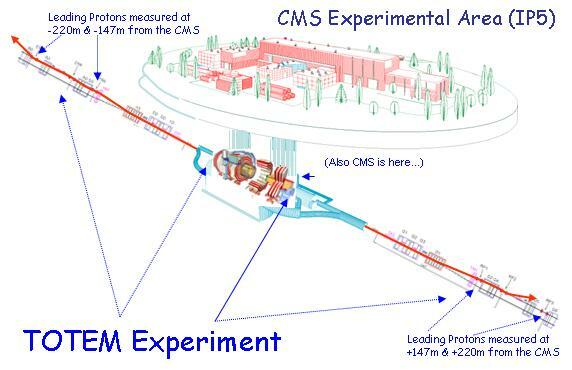 ); but together with CMS, the analysis could be even more interesting, as the exclusive production of a body of such mass, decaying to photon pairs, would have very, very small backgrounds. Just few events could offer a chance of a discovery! The data that LHC has restarted to collect recently will soon give us an answer - and if it is a positive one, we will have even more fun with TOTEM also looking at the new thing! (Of course I need not mention that I believe this scenario is too good to be true, and that reality will yield us another lemon...) In any case, the next few months will be decisive, so stay tuned!